January 6, 2019 has marked the beginning of the most wonderful time of the year: awards season. January 6, 2019, has marked the beginning of the most wonderful time of the year: awards season. With awards season comes awards fashion, and the stars hardly ever disappoint. At this year's Golden Globe Awards, hosted by Andy Samberg and Sandra Oh, the red carpet expectations have heightened due to one of the most sought after arrivals of the evening: Best Actress nominee Lady Gaga. Some of Lady Gaga's most iconic red carpet appearances. There's a reason that the E! Red Carpet Special declared that she was the most anticipated arrival of the evening. 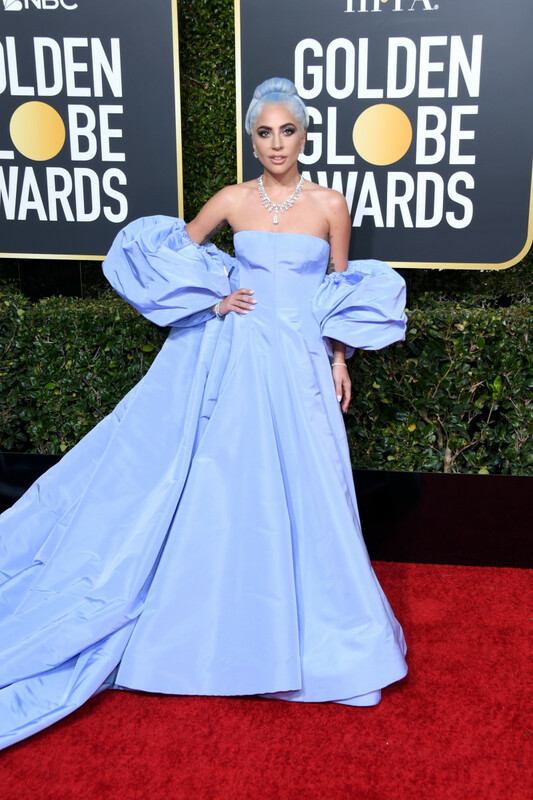 Gaga has notably been known for her eccentric fashion choices over the years, so her appearance at the Golden Globes has caused attendees to bring their best. Alas, here are the 12 best-dressed stars at the 2019 Golden Globe Awards. You didn't think she wouldn't make the list after that intro, did you? Time and time again, the A Star is Born actress has proven that she is a fashion trailblazer on the red carpet. For the first major awards ceremony of the season, the singer opted for a periwinkle Valentino gown and Tiffany & Co. jewelry. Christian Bale, pictured with his wife Sibi Blazic, showed up in black-on-black-on-black. The Golden Globe winner for Best Actor in a Musical or Comedy Film was donned in a complete Brioni suit with Cartier accessories. Regina King, who took home the Golden Globe for Best Supporting Actress in a Motion Picture, looked stunning as she walked the red carpet. This custom Alberta Ferretti gown hugged her curves in all the right places and its sequin embellishments were sure to shift all eyes towards her. After his Met Gala look mid last year, the American Crime Story actor and Golden Globe winner held a high standard for his future red carpet appearances. 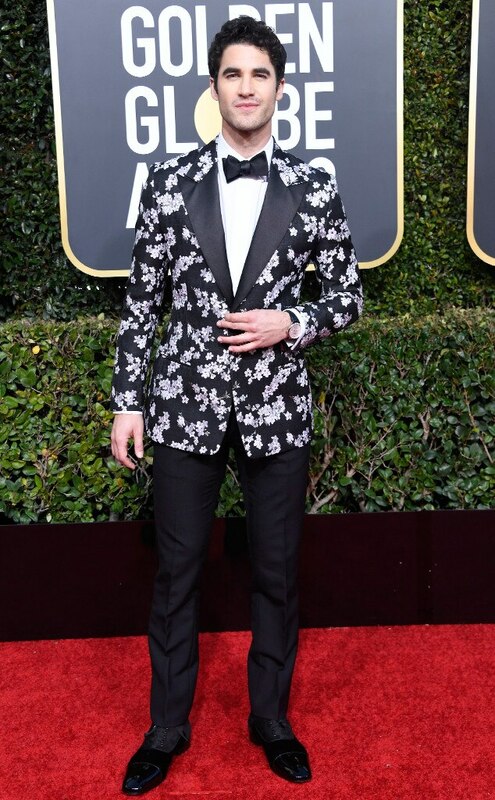 Let's just say he did not disappoint in this floral Dior suit. Dazzling gowns seemed the shine down the red carpet and become a reoccurring trend the entire evening. Saoirse Ronan kept it flirty and chic with this Gucci gown. 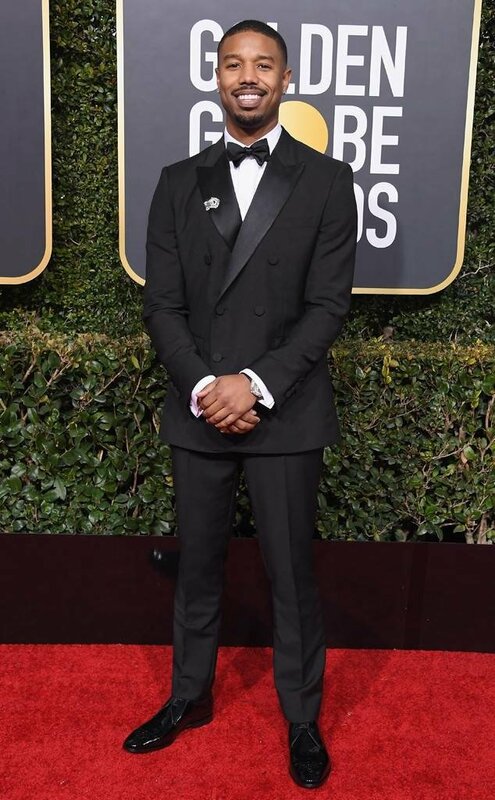 You could take Michael B. Jordan out of this Burberry number and he would still probably make a best-dressed list. Sorry, not sorry. The Fahrenheit 451 star classically paired a white dress shirt with a satin bow tie. The pop phenomenon didn't make an official Golden Globes red carpet appearance, but she did present the award for Best Original Song in a Motion Picture and attend the InStyle and Warner Bros after party. Swift rocked a black corseted Atelier Versace gown with a high slit. She also wore her classic red lip and Atelier Versace strappy heels with Lorraine Schwartz jewelry. John Krasinski has not only killed it in Jack Ryan and A Quiet Place but on the red carpet. Krasinski sported a navy blue Brunello Cucinelli tuxedo detailed with a satin collar, and matching blue bow tie, Christian Louboutin dress shoes. Even his IWC watch and blue Montblanc cufflinks were blue. We love a stylish monochromatic king. Kiki, we are riding for this marvelous fashion choice. The If Beale Street Could Talk star looked breathtaking in this blush tulle gown by Dior. Talk about a power couple! Bradley Cooper made a simultaneously classic and bold fashion choice with an all-white ensemble. The Best Actor in a Drama Film nominee accessorized with black dress shoes, a black bow tie, and his father's cufflinks. One would think that sequins and feathers (along with a cape!) should never be on the same garment, but Debra Messing's Pamela Rolland gown proves otherwise. The classic black and silver color combination is truly what saves this outfit, along with Messing's elegant sway and fiery tresses. 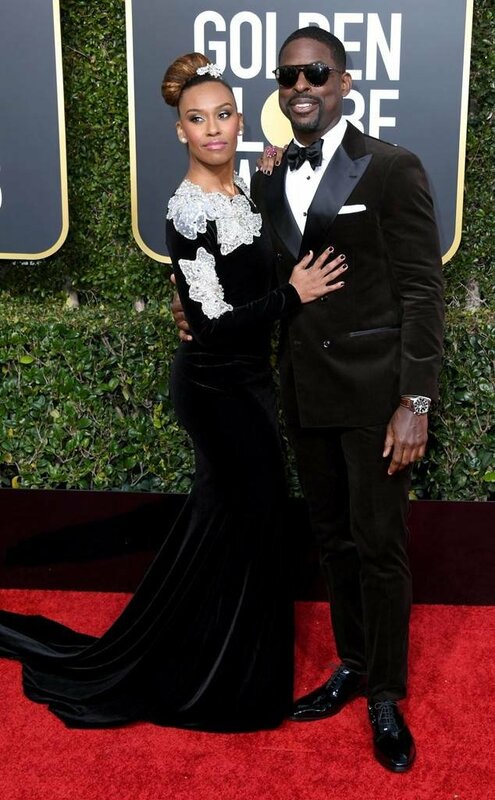 Sterling K. Brown showed up looking dapper alongside his wife, Ryan Michelle Bathe. Just like John Krasinski, the This is Us actor wore a Brunello Cucinelli suit with an IWC watch. He also paired it with aviator sunglasses, David Yurman cufflinks, and Fratelli Rossetti shoes.